December 2016 issue on sale now! | What Hi-Fi? December 2016 issue on sale now! Ding dong merrily on (What) Hi-(Fi)! Christmas planning is under way. If you're looking for a present to slip into the stocking of your favourite audiophile, then this is the naughty and nice list you've been waiting for. We have a three-way clash of 4K budget televisions, and a face-off between two stereo amps. In our First Tests are Amazon's AI speaker, the Echo, B&W's P9 Signature headphones, as well as the latest home cinema amps, soundbars, and speakers. We're filled fuller than Santa's sack this issue! If you're looking for an inexpensive television that will still deliver a 4K image and Smart TV functionality, but don't know which one to go for, we've pitted a television each from Finlux, Polaroid, and Phillips to see which emerges victorious. The first time we reviewed a £500 Ultra HD television, it received a damning one-star review. The good news is that the technology has improved significantly in the two years past, and now these low-cost 4K options are a viable proposition. So if you're thinking of picking up a new TV to watch all of the holiday specials, while still having enough cash left for presents, you're not going to want to miss this issue. On the surface, there isn't much between these Cambridge and Marantz amplifiers; both are high quality products at a relatively affordable price, both have an expressive and exciting sound, and both make the same mistake of lacking a USB input. But we've weedled out the differences and made our decision about which of these amps should go under your tree. If it's high-end hi-fi that gets your motor running then you won't be disappointed, as we take a look at a pair of £8000 stereo speakers from Monitor Audio. Everything from the cabinet and drive units to the spike assembly is brand new, but does that mean it's been improved? There's also a £2700 stereo amplifier from Parasound - think of every feature you could expect to find in a premium stereo integrated, and this product probably has it. There are few things this amp can't do. But if this is all too conventional for your tastes, and want to take a step into the future, we've got you covered with our review of Amazon's voice-activated speaker, the Echo. Sure, it's able to order pizza, call you a taxi and tell you how to spell supercalifragilisticexpialidocious at a moment's notice, but is it any good at its prime role: being a solid wireless speaker? 2016 also marks the 15-year anniversary of the original iPod, so we've taken a trip down memory lane - stopping at the houses of other portable music players along the way. It's possible that no other music player will have the same impact on the world that the iPod did, but to find out why, you'll have to read the Insider section in the mag. 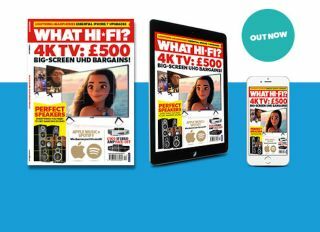 As always, those are just the highlights - there's a superb section on how to make sure you get the best option when choosing hi-fi speakers, a head-to-head between Apple Music and Spotify Premium, a round-up of the best Lightning headphones on the market and more product reviews than you can shake an elf at. There's an affordable and accessible projector from ViewSonic, some powered speakers from Wharfedale, and our Top Five of the best products that have been unveiled this month.